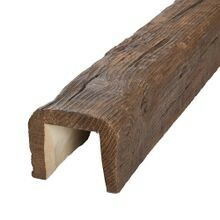 Outwater stocks these stylish foam wood beams in both 16’ and 20’ lengths. In addition, we offer several different beam accessories as well as product samples (upon request). In order to provide all customers with the fastest and least expensive shipping possible, we stock the Old World Faux Wood Beam series in our local New Jersey and Arizona warehouse facilities. If you are having trouble finding the rustic beam that meets your needs, contact our friendly sales department for more information on the entire collection of faux wood beams and other architectural products offered by Outwater Industries.